April 19, 2012, Addis Ababa – Started the morning with our first Ethiopian coffee ceremony and a warm welcome from Mulu Haile, Executive Director of MCDP – Mission for Community Development Program, here in Addis. MCDP is a well-established Ethiopian NGO that was founded in 1998 with a mission to bring change to the lives of disadvantaged women and children in Ethiopia through integrated and participatory community development. CFTC is supporting their work enhancing livelihood options for poverty reduction for parents, child sponsorship, and support for orphans and vulnerable children through early childhood care and education. And might I say, they do a fantastic coffee ceremony – complete with roasting beans, wafting frankincense and wonderful end product. One of the highlights of our day with MCDP was meeting the parents of sponsored children who have created a parents’ cooperative to deliver sustainable livelihoods and not become dependent on the sponsor a child program. With just a little seed money, MDCP set up a savings and credit scheme for parents of sponsored children and encouraged them to improve their own livelihoods so that they could afford to cover the support provided by the sponsorship program. A great turn-out of 235 parents signed up for the Tiret Cooperative. MCDP trained them to run a business, keep their books, manage their time – and they even provided training in ‘team spirit’ to ensure that the relationships of those involved stayed strong. 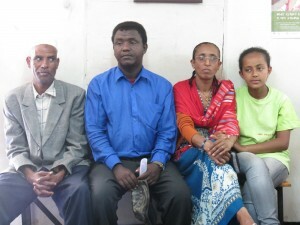 One great story was told by Taddellecha (a name that means “lucky” in Amharic), a woman who had been living in very poor conditions with her husband, her elderly mother and three children, one of whom is part of the CFTC-MCDP sponsorship program. Taddellecha borrowed 444 birr (about $25 CDN) and used it to first pay off her debts and then to start trading in ‘petty goods’ – which includes households goods such as brooms, charcoal, eggs and chicken to sell at times of local celebrations and at local bazaars. 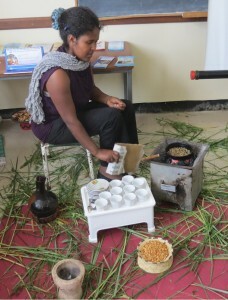 Taddellecha paid back this loan and took out a larger 3,000 birr loan (approximately $175 CDN), with which she rented space to sell more goods. She engaged her mother to help sell goods while she was out sourcing them. In time, this loan was also repaid and Taddellecha she borrowed another 6,000 birr (about $350 CDN) to buy a refrigerator, which she put in her store and began to make popsicles for children that her mother would then sell in addition to the expanding number of items in her store. Taddellecha is now able to help her husband support their three children and her mother – and her eyes and her confidence shone as she told us her story and how valuable the training and support had been from MCDP. This is an exciting idea as Ethiopian organizations are trying to move communities away from the “free hand-outs” as they are called that began back in the 1970s during the famines. As the Ethiopian government seeks to learn from local NGOs like MDCP, this is a great example of building sustainable livelihoods and community ownership where it seemed impossible before. 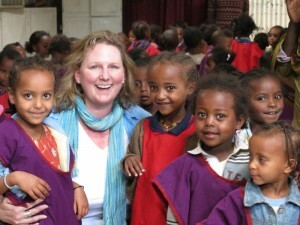 Visiting with some of the children who attend MCDP's award-willing ECCE. Another cool idea is the work that MCDP has done to promote early childhood education as an extension of the child sponsorship program they are doing with CFTC. As part of the new Ethiopian government policy to promote early childhood care education (ECCE), MCDP has created a prototype ECCE centre for pre-Grade 1 children, the age when primary school typically begins. The centre is a series of modified classrooms that CFTC helped make happen, and each classroom has small learning areas for numbers, the alphabet, health, and much more. 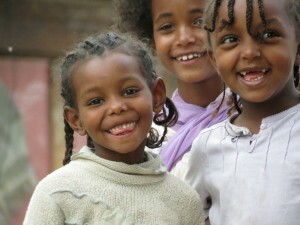 ECCE is a new concept in Ethiopia. Just this morning, 100 education directors from other schools came to view the site and meet the staff — prompted by hearing of MDCP’s recent award from the government for the best ECCE centre. It’s very exciting that CFTC is supporting this kind of innovation to help promote education for younger children in Ethiopia which will in turn support long-term education goals. Official Latrine Reveal! 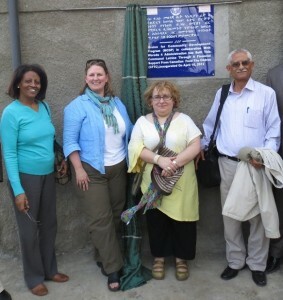 (with Mulu Haile on my right, CFTC's Program Manager, Ethiopia, Francoise Briet, and Country Representative, Gebriel Galatis). We wrapped up the day with the inauguration of a latrine in the same community as the cooperative. This inner-city community had been pushing for a communal latrine as they had been left to use the streets and pathways – and this has caused significant health issues as well as made living in the community quite unpleasant. With support from MCDP and funding from CFTC, the government agreed to give the community the land on which to build this six-room latrine – and the community contributed labour and materials. Lots of speeches, profile on local media, and the excitement of cutting the ribbon with Mulu from MCDP and two government officials capped off the day, followed by another wonderful coffee ceremony with a happy community for whom this latrine will support 60 families. Really inspired seeing MCDP in action – and to learn that the work we are supporting is not just making a difference, but is creating innovation and sustainability in ways that can be replicated by other NGOs. How cool is that! Did I mention that we ended the day with yet a final coffee ceremony? And that Ethiopian coffee is delicious? We did and it is!